In the rural town of Fountain Green, Utah, pop. 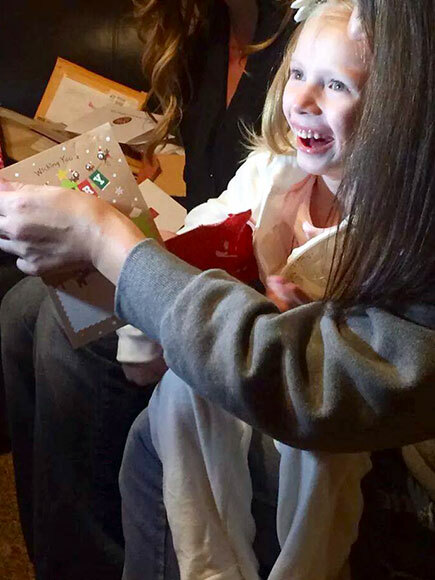 1,078, the post office on State Street is overflowing with cards, letters and gifts for 6-year-old Addie Fausett, whose Christmas wish is to know that she has friends. Addie, who stopped growing when she was 3 due to a mysterious and still undiagnosed illness, isn't expected to live much beyond another year. Here’s something you can do this Christmas time to bring a little joy into a girl’s heart. And this is not doxxing. Her mailing address is Box 162, Fountain Green, UT 84632. There is a reason so many people are sending Addie a Christmas card. “She kind of stopped growing when she was 3,” said Tami Fausett, Addie’s mother. And slowly since then, the bubbly and energetic little girl who now weighs just 23 pounds continues to struggle. “She likes to laugh and have a good time and hear stories, but lately she has had a lot of days she will just cry all day long,” Tami Fausett said. And even with many visits to neurologists at Primary Children’s, Addie’s condition has gone undiagnosed. Update: It is also worth noting that like with John Hoge, Brett sent service of process late and misled the court about that fact, in violation of the Federal Rules of Civil Procedure. But to Brett Kimberlin, rules are for little people, right? Oh, um, okay, I stand corrected. I mean that for Brett Kimberlin, rules are for other people. We now resume the original post, as is. Just a quick notice to my readers, barring any surprising turn of events I will suspend blogging for the near future. Like hopefully a week. On Monday, Brett Kimberlin filed his opposition to my motion to dismiss his dumb RICO case, which you can read in all its “glory” here. While I will play it close to my vest in terms of strategy, I will note that it is exceptionally clear that he has just given up. After being granted an extension to reply of over four months, most of his opposition is simply cutting and pasting from prior oppositions. That isn’t necessarily wrong, mind you, but the problem is that he has cut and pasted sections that were not only wrong, but I and others had shown him how wrong it was. So he’s barely trying anymore. Anyway, I appreciate your patience, and your faith in me. This is a series of posts where I plan to go through all 4799 pages of transcripts before the Grand Jury in the Darren Wilson case, in order to figure out 1) should he have been indicted, and 2) is he guilty? Some background. This is the post introducing the series and giving you many images that have been released. This earlier piece on Zimmerman also gives you a good primer on the law of self-defense in general, at least in Florida, while this piece discusses how Missouri law deals with self-defense and the unique right of a cop to use force to stop a fleeing suspect (in some cases), and this piece discusses (albeit briefly) the standard for indictment. I am not going to explain these points of law twice, so if you are confused, go back and read those. This post will be updated to link to other posts in the series without notation that it has been changed. In Part 1, we reviewed the opening remarks by the Prosecuting Attorney, Bob McColloch, and introducing the two attorneys who would be running the show for the most part from then on: Kathi Alizadeh and Shelia Whirley. We reviewed two witnesses who gathered evidence for others, but didn’t actually analyze it. In Part 2, we had another detective who merely gathered evidence for others... at least as far as he testified that day. That was interrupted by a medical examiner who testified about the autopsy. In Part 3, we heard from Darian Johnson, both in the form of media clips and from his own mouth. We also reviewed the private autopsy done by Dr. Baden. In Part 4, I point out what a complete idiot Karoli is, and I talk about Wilson’s side of it, including his actual testimony. In Part 5, we reviewed the stories of two more lay witnesses, including one identified as Witness 10. Now, unlike last time, I want to cover some news and other issues outside of the transcript, before I start. Louis Head’s Incitement. First, you might have seen me last week discuss the possibility that Louis Head might have committed incitement. Hey, feel free to read the whole thing, but here’s the headline: it’s pretty open and shut that he did incite the mob in a way that can be punishable under the First Amendment, but Missouri doesn’t seem to have a statute that covers such incitement. In other words, Missouri could criminalize such behavior, but it doesn’t seem to have chosen to. As I joked on Twitter, maybe Missouri should add such a law, call it Natalie’s law, after the woman whose cake shop was looted during the riots. Since these posts are also a repository of random news, I will note that over the weekend, Wilson resigned, and didn’t even get a severance. That last part is surprising, because in my experience many people resigning have gotten them if only in exchange for promising not to sue their former employer. This is either a confession that he wouldn’t have a viable claim, or simply nobility on his part. I report, you decide. And for that matter, it wouldn’t surprise me if he is hoping that by being decent to his former employer, it will make him more employable in the future. In Part 1, we reviewed to opening remarks by the Prosecuting Attorney, Bob McColloch, and introducing the two attorneys who would be running the show for the most part from then on: Kathi Alizadeh and Shelia Whirley. We reviewed two witnesses who gathered evidence for others, but didn’t actually analyze it.